What a difference a few (two) weeks makes in a vegetable garden. I took this picture above on Saturday after I finished re-mulching the paths around the raised beds. Yes, I waited until the warmest day of the year so far to go and get a few truckloads of mulch. 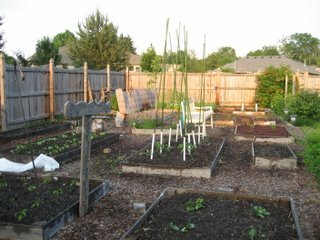 Below is a picture of the same garden just two weeks ago, and approximately two weeks after I planted it. I think new gardeners should try a vegetable garden first to get a real taste for how successful and inspiring planting and tending a garden can be. 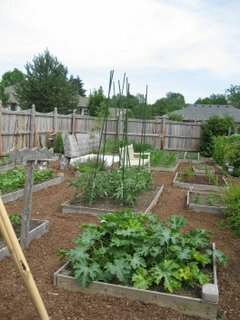 I don't think anything grows faster than vegetables, and there is great satisfaction in getting actual food from your own garden. Impressive! Whenever I mulch a spot I'm always amazed at how much more like a garden my garden looks. Sometimes I wonder what the plants are for. Your raised beds are inspiring. Maybe after the heat of summer is over, I'll put in a fall garden this year. I always mean, too, but the problem is figuring out when summer is going to be over.